Property Size 1,059 sq. 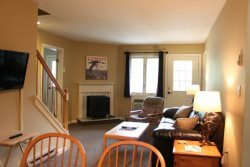 ft.
Two bedroom, first floor rear with deck entry from the parking lot. Features bedroom with Queen bed, A/C, flat screen TV/DVD, full bath and walk-in closet. Second bedroom has Queen and bunk bed and full bath. Fully applianced and utensiled kitchen with table and 4 chairs. Dining area with table and chairs, living room area with sleep sofa, gas fireplace, A/C, 32" flat screen TV and DVD.